Long before the space race and space shuttle, a brilliant, wealthy, charming Boston Brahmin named Percival Lowell popularized the idea that we are not alone in the universe. As the next US spacecraft prepares to descend upon the Red Planet, it's an idea worth revisiting. AT 7:36 P.M. ON May 25, if all goes well, a stranger from Earth will land near the north pole of Mars. It is called Phoenix. To the unscientific eye, it looks like a giant winged bug. It has three legs and a 5-foot-wide central science deck. With its two solar panels deployed, it measures about 18 feet long. It is 7 feet high. It weighs 772 pounds. Its landing parachute is 39 feet wide. When it touches down on the Martian landscape, it will have traveled 423 million miles - the equivalent of almost 18,000 trips around Earth. Approximately 17 minutes after it lands, its first signals will be received by its controllers. Then it will begin the task for which it was designed - a task that has never been performed before. It will extend its robotic arm and scoop up dirt and ice from beneath the Martian surface for analysis. It will be looking for evidence of life. "Finding organic compounds on Mars will increase the probability that life may have or does exist there," says Tufts University professor Samuel Kounaves, the lead scientist for the wet chemistry investigation on NASA's Phoenix mission. Somewhere, a 19th century Boston Brahmin named Percival Lowell will be smiling. Long before NASA was established in 1958, before JFK's impassioned speech about the space race, and before any of the Apollo missions or space shuttle successes and disasters, Percival Lowell devoted much of his career and considerable fortune to trying to prove that Mars hosted intelligent life. Viewed through his telescopes, the ancient, baleful Red Planet was about the size of a dime. Lowell believed he was seeing a network of canals on its surface. Therefore, he declared, Mars holds intelligent life. It is not necessarily like human life, he emphasized, but it is intelligent enough to build canals. It is Lowell's vision of Mars that has enthralled and inspired earthlings ever since. In 1895, Lowell published a book about what he believed he saw. He wrote articles about it for Popular Astronomy and The Atlantic Monthly. He lectured widely about it. He became famous and immensely popular. He was "of medium height, slim and handsome, with an athletic build and an intense expression," his biographer, David Strauss, professor emeritus of history at Kalamazoo College in Michigan, writes in an e-mail. "His erect bearing and fastidious dress contributed to a commanding presence." Lowell enchanted the public with his charisma and the power and conviction of his beliefs. "He was a very effective popularizer of his ideas," says Robert Millis, director of the Lowell Observatory. "He was the Carl Sagan of his day." The scientific community was less enthusiastic than the general public about the notion of intelligent life on Mars. No matter. Wealthy, brilliant, charming when he wanted to be, Percival Lowell was confident in his heritage and convinced of his superiority to the "ruck and rubble" from Southern and Eastern Europe flooding onto America's shores. He was also seriously inner-directed. And with what he was certain was his discovery of the canals, he had found his life's work: to promulgate his sensational belief that Mars was the home of Martians. LOWELL WAS BORN AT 131 TREMONT STREET in Boston on March 13, 1855, into a family at the pinnacle of what passed for American aristocracy. The first Percival Lowle, as it was then spelled, arrived in America in 1639 from Bristol, England ("the Venice of the West"), and settled in Newbury, north of Boston. His descendants flourished in the law, business, and the arts. Percival Lowell's upbringing was entirely conventional for a boy of his time and class: early instruction at a "dame school," a couple of years' education in France, attendance at Mr. George W. C. Noble's school to prepare for Harvard. At college, he excelled in both history and mathematics. He won a Bowdoin Prize for his essay on England as a European power, and he gave a commencement address on "The Nebular Hypothesis." Some people thought him the most brilliant young man in Boston. After graduation and the obligatory tour of Europe, he settled into the family business, much of which involved the textile mills in the city of Lowell. There were - and are - many canals in that city. Before the first brick of the first cotton factory was laid there in the 1820s, Irish canal-cutters - intelligent life - dug the canal beds and built the granite walls to channel the Merrimack River's water to power the mills. Lowell chafed at life in cold, caste-ridden Boston. He was the most eligible bachelor in the city, but he was not happy. He served as best man at the wedding of Edith Jones and Teddy Wharton, but he himself did not want to be married. He became engaged to a Boston girl, but broke off the engagement - a more serious matter then than it is now. A man of his time and class, Lowell was a patron of London tailors, a sometime presence on the American expatriate scene in Europe, a connoisseur of wine and spirits deeply opposed to the idea of Prohibition (which fortunately for him did not come in his lifetime). He was an avid reader of Greek and Latin classics in the original and of Chaucer in Middle English. He liked detective stories, too. An enthusiastic polo player, he was one of the founders of the Dedham Polo Club. Within his own household, he was something of a tyrant and was once witnessed kicking his butler down the front steps of his Beacon Hill home and throwing the unfortunate servant's trunk after him. At a lecture in 1882, Lowell heard about this exotic, faraway land called Japan - at the time, a place as alien, as mysterious, as Mars is to us today, possibly more so. Having made a comfortable fortune in his own right, he decided to go there. For a few years, Japan was all he desired in the way of adventure and separation from Boston. He wrote three well-received books about Japan, and he published a book of photographs about Korea - the first ever seen by the American public of that land. For a time, he served as minister for the first Korean delegation to Washington. The lure of the Far East faded, however, when he encountered the writings of the Italian astronomer Giovanni Schiaparelli and the French astronomer Camille Flammarion. There were, Schiaparelli said, "canali" on the planet Mars; Flammarion enlarged upon that idea. In Italian, canali means "channels"; a secondary meaning is "canals," and that was the meaning - the misinterpretation - that was given to Schiaparelli's assertion. WHEN LOWELL WAS A BOY, he had been given a small telescope, and with it he gazed in fascination at the heavens from the roof of the family home at "Sevenels" in Brookline. Now, as an adult, he was about to embark on a new career: astronomy. It would bring him more fame - and more scorn - than he could have imagined. Mars was to be in opposition to Earth in 1894 - closer than usual as it traveled its elliptical orbit, and thus in prime position for viewing. 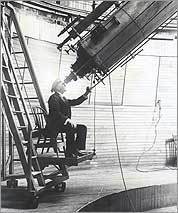 Lowell borrowed two telescopes and ordered another, with a 24-inch lens, from the best manufacturer in the country, Alvan Clark & Sons of Cambridgeport. He delegated a man to find a place with the clearest atmosphere for "good seeing." Flagstaff, in the Arizona Territory, was delighted to receive him; the townspeople understood that the Lowell Observatory would bring them worldwide fame. Lowell built his observatory there on "Mars Hill"; eventually he built a 25-room "Baronial Mansion" there, too. In the clear desert and mountain air, far from the constraints of Boston and free to gaze at the stars with his cherished "Clark," Lowell was happy at Mars Hill. He spent much of the rest of his life there. From his garden and the surrounding desert and mountains, he sent exotic plants to professor Charles Sargent of the Arnold Arboretum. He hosted his many friends and, often, strangers; improbably, he dressed up as Santa Claus to help the local children celebrate Christmas. The appearance of Lowell's book about Mars in 1895 came at a time of canal-building on earth. The Suez had recently been constructed; the Panama was in the works. For both Lowell and his adoring public, the prospect of canals on a neighboring planet was too captivating to dismiss. Let the stuffy academic scientists and astronomers carp and criticize, let them proclaim that there could not possibly be life on Mars because the Martian atmosphere was too thin, its gravity too weak. Lowell knew what he knew. He envisioned Mars society as a kind of utopia, with a place for every man and every man in his place. On Mars, there was no nonsense about workers' rights or labor unions or Progressivism or Socialism or any of the other discontents in the America of his time. In 1897, Lowell had a nervous breakdown. At first his family tried to nurse him at home with the most up-to-date treatment: solitary confinement, no visitors, no reading material, no distraction or intellectual activity of any kind. Such a cure, Lowell said, was worse than the illness itself. After a month, he abandoned it. He went to Bermuda and then to the south of France to recuperate. In 1901, Lowell returned to Flagstaff. Night after night, when the seeing was good, he would climb the ladder in his observatory to peer through the lens of his Clark telescope at the object of his obsession. He published his second book about the Red Planet, Mars and Its Canals, in 1906. Because Lowell wanted a base in Boston separate from his family, he bought a house at 11 West Cedar Street on Beacon Hill. The seller was a neighbor, an interior decorator, a woman not of his exalted class. In 1908, he married her. While in London on their honeymoon, they ascended 5,500 feet over Hyde Park in a balloon because Lowell wanted to photograph the paths to see how they (or the canals on Mars) would look from the air. In that year, he published his third and final book on the planet, Mars as the Abode of Life. Back at his observatory on Mars Hill, Lowell renewed his attention to another matter: the possibility of a ninth planet beyond Neptune, which he called "Planet X." The issue of intelligent life on Mars receded, but not much. By then, George du Maurier had published The Martian and H.G. Wells had produced a sensational fiction piece about Martians invading Earth, The War of the Worlds. Edgar Rice Burroughs, a pulp writer who later found immortality with his Tarzan stories, published the first of his Mars fantasies, A Princess of Mars, in 1912. It was an immediate hit. Burroughs wrote several sequels. Along with works by other writers, it was the beginning of the cottage industry that came to be called science fiction. Despite having another breakdown in 1912, Lowell concentrated increasingly on Planet X. He never found it. He died at Mars Hill of a cerebral hemorrhage on November 12, 1916. A member of the Mars Hill community remembered that shortly before his fatal stroke, he had exploded in anger at a servant. He is buried there in a mausoleum shaped like an observatory with a blue glass dome. Fourteen years later, in 1930, Lowell Observatory announced the discovery of a ninth planet: Lowell's Planet X. Pluto, as it was named, has since been downgraded to dwarf planet status because it is so small, so lacking in what might be called gravitas. NINTH PLANET OR NO, Percival Lowell's greatest achievement was to popularize the idea of life on Mars. Astronomers had speculated about that possibility for centuries, but it was Lowell who implanted in the minds of earthlings, once and for all, the idea that we are not alone in the universe - an idea once as unthinkable, as heretical, as the notion that the earth revolves around the sun. Accordingly, in the decades after Lowell's death, the science-fiction genre flourished. Novels, pulp magazines, and the new media of radio, film, and TV kept Lowell's basic concept of Martian life alive, even if that fictional life was not quite the kind he would have approved of. The public adored these speculative fictions - and sometimes believed them. On the night of October 30, 1938, Orson Welles and his Mercury Theatre company appeared in a radio production of The War of the Worlds, updated to suburban New Jersey. At the beginning of the program, an announcer stated that it was a fictional presentation, but many people didn't hear that disclaimer. What they heard was a vivid, spine-chilling account of the invasion of New Jersey by Martians - not Percival Lowell's wise and rather hidebound creatures, but quite nasty super-intelligent beings intent on destroying earthlings. Panic ensued; Welles was thrilled at his success. The lesson was that two decades after Lowell's death, people were prepared to acknowledge that life existed beyond earth - and that it could come here with hostile intent. During the first wave of Lowell's fame at the end of the 19th century, Robert Goddard of Worcester dreamed of a voyage to Mars. His subsequent development of the liquid-fuel rocket was known to German scientists who made the V-1 and V-2 rockets during World War II. After the war, many of those scientists came to the United States, while some went to the Soviet Union, and the space race was on. The leading US space scientist was the former head of the German rocket manufactory (and slave camp) at Peenemunde, Wernher von Braun. Like many of his peers, von Braun was enchanted by the idea of man going to Mars. He was also, like Percival Lowell, a popularizer. He published articles and a book about a Martian expedition; he also wrote a novel about Mars. The space program needed government financing, and the hundreds of science-fiction writers and filmmakers flourishing by the mid-20th century fostered the public's support for the program. People were eager to know about Mars, in particular. In 1976, Viking 1 and Viking 2 transmitted spectacular pictures of a ruddy landscape studded with giant volcanoes and riddled with deep canyons separated by stretches of vast desert. No sign of life was apparent. There has also been a continuing effort to receive a signal from space. This program, SETI (Search for Extraterrestrial Intelligence), is of two kinds: active and passive. Those who favor passive listening warn that when we do encounter extraterrestrial life - or when it encounters us - it may not be friendly. Finally, early in the 21st century, came life-altering news. The Mars Opportunity Rover had found evidence that Mars had been "soaking wet" in the past. Water meant life - or possible life, at any rate. Soon after that discovery, someone left a glass of champagne at the mausoleum of Percival Lowell with a note: "Far away, hidden from the eyes of daylight, there are watchers in the sky" (Euripides, The Bacchae, circa 406 BC). THE MARS WE SEEK, WITH OR WITHOUT canals and no matter what the Phoenix mission demonstrates, is Lowell's Mars. The Mars of our imagination is his fantasy, transmogrified a thousand times by writers and filmmakers. The questions that haunted him - questions to which he believed he had found the answers - are questions that haunt us still. Is there life on Mars now? Or was life there once, long ago? If so, what form did it take, and how and why did it die? Is the secret of life on Mars the secret of our own fate? Now scientists anticipate the landing of the Phoenix next month. "We are investigating if the soil has the ability to support life, past, present, or for future humans who may land there," says Tufts' Kounaves. The Phoenix will carry four wet chemistry labs to analyze the Martian ice and soil, as well as the first optical and atomic-force microscopes. The craft has been sterilized in accordance with NASA's planetary protection policy to ensure against contamination by earth organisms. Some people wonder if the space program is worth all the money and effort. Most definitely, says Maria T. Zuber, E.A. Griswold Professor of Geophysics and head of the department of earth, atmospheric, and planetary sciences at MIT. "If you look at how our understanding of the universe, the solar system, and the earth itself have advanced from observations made since the dawn of the Space Age 50 years ago, it's clear that the results have been every bit worth the investment." The Phoenix mission and its search for evidence of life on Mars is an important step forward in that understanding. Meanwhile, plans for "terraforming" Mars proceed. Terraforming means making the planet - any planet - fit for human life. This research is being conducted in Mars-like environments like Siberia, the Antarctic, and the Canadian Arctic. "The key challenge in making Mars habitable is warming it," says Christopher McKay of NASA's Ames Research Center, a lead researcher in planning for future Mars missions. "The way to warm Mars using technologies we have already demonstrated is to use super-greenhouse gases." McKay estimates it will be at least 25 years before we can establish a long-term research base on Mars and that warming the planet might take 100 years. One problem will be water: how to melt it, possibly make it fit for human use, and then transport it from the planet's ice caps to the equatorial regions where the colonizers will want to be. The late Carl Sagan had a solution. If we wanted to transport water across Mars, he said, "we would build canals." Nancy Zaroulis writes frequently about Massachusetts and its people. Send comments to magazine@globe.com.